No matter where in the world you call home, chances are you've heard of Yellowstone National Park. This 3500-square-mile park is usually regarded as the , having been designated as one in 1872. It's known for its dramatic canyons and geothermal activity, along with its wildlife like bears, wolves, and bison. Located mostly in the state of Wyoming (but with little bits also in Montana and Idaho), Yellowstone is one of the most-visited national parks in the U.S., too – which is why it was such an oversight of mine for so long! But I finally made it to Yellowstone in 2017. 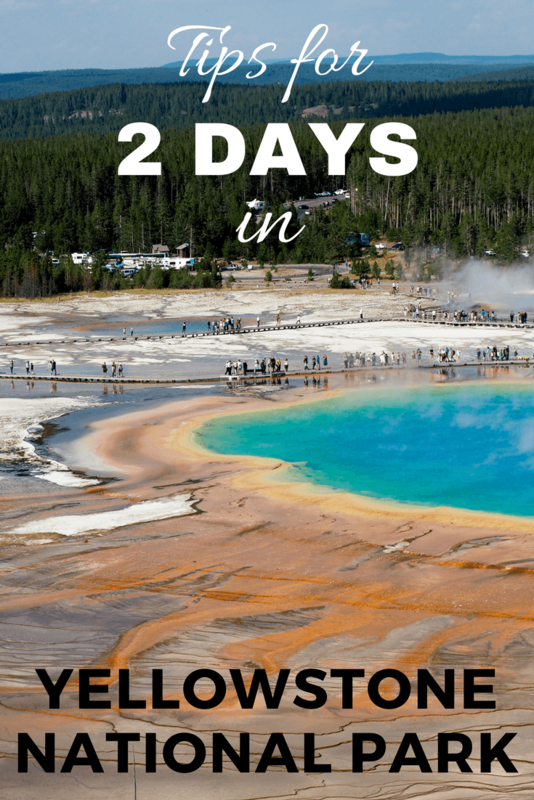 Ideally, you would have 3-5 days to truly explore and appreciate Yellowstone – especially if you're visiting in the busy summer months where getting from A to B and finding parking can sometimes take a little extra time. BUT, if like my sister Melissa and I you only have 3 nights and 2 full days to dedicate to Yellowstone, here's how I would suggest spending your time. It depends on which direction you're coming from, of course, but I highly recommend spending the night before your first foray into Yellowstone somewhere close by. My sister and I stayed in Cody, Wyoming, which lies to the east of Yellowstone. Cody is a cool little city in its own right, being home to the Buffalo Bill Center of the West. We stayed at the , which is a nice motel on the road to Yellowstone. The next morning, we had about an hour-long drive along the Buffalo Bill Scenic Byway to the East Entrance to Yellowstone. Entering Yellowstone from the East Entrance, head towards Fishing Bridge, which will take you partially along the shores of Yellowstone Lake (and along the edge of the caldera of the ancient Yellowstone supervolcano!). At the junction, turn right toward Canyon Village. It's then just under 16 miles to the Grand Canyon of Yellowstone. This part of the park is very aptly named – the canyon carved out by the Yellowstone River is huge and deep. Very grand indeed. There are quite a few viewpoints of the canyon, with my absolute favorite being Artist Point. From here, you can see a good portion of the colorful canyon leading back towards Lower Falls, one of the two waterfalls found in the canyon. The parking lot at Artist Point (which can be accessed from the South Rim Drive) is quite large, but you can still expect to wait a while for a parking spot during the summer months. If you're up for a short hike (and if you can find legal parking nearby along the one-way North Rim Drive loop road), make the hike down to the Brink of the Lower Falls. Switchbacks take you roughly 300 feet down into the canyon to the top of Lower Falls. After stopping at some viewpoints along the canyon, Melissa and I stopped in Canyon Village for lunch, where there are a handful of food options and a visitor center. Yellowstone is well-known for its wildlife, and it's not uncommon to come across traffic jams when someone spots a moose or elk or bison or bear along the side of the road. If you want the best chances of seeing some of Yellowstone's bison herds and resident wolves, though, you need to head to the the Lamar Valley east of Roosevelt. From Canyon Village, continue north until you hit Roosevelt and then turn right and head towards Yellowstone's Northeast Entrance. The road to get here twists up and down a small mountain, so expect the drive to take more than an hour, even though it's only about 35 miles on the map. Once you're in the valley, your chances of seeing animals like bison and pronghorn are extremely high – this is where most of Yellowstone's herds of grazers call home. You can also often spot bears and wolves in this part of Yellowstone, especially if you're in the area around dusk. Melissa and I technically saw a bear, but it was super far away and not any bigger than a speck even when viewed through my 300mm telephoto camera lens. My best tip: Look for carcasses near any of the rivers that are near the roadway – this is where we spotted the bear, and where people the day before had seen wolves! Had I planned out our route better ahead of time, I would have had us stay near Yellowstone's Northeast Entrance on Night 2 so we could have stayed in the Lamar Valley later and driven through again the next morning. We didn't spot any wolves in Yellowstone but would have really liked to! You can look for accommodation in and around . What we did instead was drive back across the park to West Yellowstone, where we stayed at , a very cool glamping site very close to the West Entrance to Yellowstone. I loved staying there, but it was a bit of a drive from the Lamar Valley to West Yellowstone. Regardless of where you stay on Night 2, I recommend starting your second full day in Yellowstone at Mammoth Hot Springs. Mammoth is one of two major geothermal areas within Yellowstone, characterized by hot springs bubbling and steaming down a hill of travertine terraces. Park at the Upper Terraces and walk the boardwalks over the hot springs and down to a viewpoint of the terraces and Canary Spring. Then you can also walk down to the Lower Terraces and around all the crazy, steaming formations. Afterwards, head into the Mammoth Hot Springs village to stop in at the visitor center and maybe grab some food. Next, it's time to head down to Yellowstone's geyser basin. This was my favorite part of the park, but also probably the most crowded! You could easily spend an entire day just in this section of the park, but we opted for just the highlights. We stopped first at the Midway Geyser Basin, where you can walk on boardwalks around Excelsior Geyser Crater and the famous Grand Prismatic Spring. But I wanted to see Grand Prismatic Spring from above like on all the postcards. And the good news is that now you can! Drive a little further along the road towards Old Faithful, and park at the Fairy Falls trailhead (there's a decent amount of parking, so you shouldn't miss it). Follow the flat, gravel trail until it splits, and then take the left fork up the side of a hill. In less than 10 minutes, you'll be at a new overlook built just for viewing Grand Prismatic Spring from above! From there, we headed to Old Faithful and parked near the visitor center. Lucky for us we arrived just minutes before the famous geyser was due to erupt (it goes off every 45-120 minutes, and they predict the next eruption at the visitor center). We saw Old Faithful erupt for nearly 3 minutes. If you still have time, go for a walk on the boardwalk trails that weave through the Upper Geyser Basin around Old Faithful. This is the largest concentration of geysers anywhere in the world – in fact, more than half of the world's geysers are located in Yellowstone! You could do another night in (or a first night if you decide to stay in Cooke City on Night 2), but I actually recommend continuing on from the geysers to the South Entrance of Yellowstone and on to Grand Teton National Park and/or Jackson, Wyoming. Grand Teton is MUCH smaller than Yellowstone, meaning you don't need an entire day to drive from one end to the other. You can stop along US 89 at lookouts like Oxbow Bend and Willow Flats, which are some of the best places in the park to spot wildlife in the evenings. You also may get some great views of the sun setting behind the Grand Tetons. If you want to treat yourself, consider staying a night at either the or within Grand Teton National Park (meaning you can spend the next day in the park, which is 100% worth it!). I can't stress enough the importance of being a responsible (and smart!) tourist when it comes to wildlife in Yellowstone National Park. Despite all the vehicles traversing the park roads during the busy summer months, you're still likely to see animals fairly close to your car – everything from bison to bears. Respect that these are WILD animals; they aren't pets and you aren't in a zoo. Maintain a safe distance from any wildlife you may come across (at least 25 yards is usually recommended), and DO NOT try to approach or feed them. Bison especially may look fairly slow and docile, but the bulls especially can be very dangerous. The speed limits posted in Yellowstone vary from 25 to 45 miles per hour, and they're set as such for good reason: a combination of winding roads or the possibility of wildlife running out in front of you. But this – coupled with the fact that you may run into a traffic jam or two – means it will take you longer to drive from one section of Yellowstone to another than you might assume. So always overestimate driving times so you're not rushed! I mentioned above that no one really heeds the “do not stop on the side of the road” signs in Yellowstone, especially when wildlife is involved. I also mentioned that the park can be particularly crowded in the summer months. This means you'll need to pack some patience with you. Parking at some of the more popular lookouts and attractions can fill up early in the day, and you may have to do some circling (I did my fair share at both Artists Point and the Middle Geyser Basin). If you want to stay *in* Yellowstone (like at the famous or the ), you'll need to book your accommodation far in advance. Even if you're planning to stay just outside the park in places like West Yellowstone, rooms fill up quickly. This isn't something you can leave until the last minute – even campgrounds in and around the park will be full months or weeks in advance (especially during the summer). So, to avoid any disappointment, I would start booking accommodation as soon as you know your travel dates. Lastly, when you're planning your time in Yellowstone National Park, keep in mind that every visitor center in the park is different. The Albright Visitor Center in Mammoth Hot Springs has exhibits the park's history and wildlife. The Canyon Visitor Education Center covers the Yellowstone's supervolcano and the park's geology. The Old Faithful Visitor Education Center has exhibits about Yellowstone's hydrothermal features. Grant Visitor Center looks into the impact of the park's historic fires of 1988. 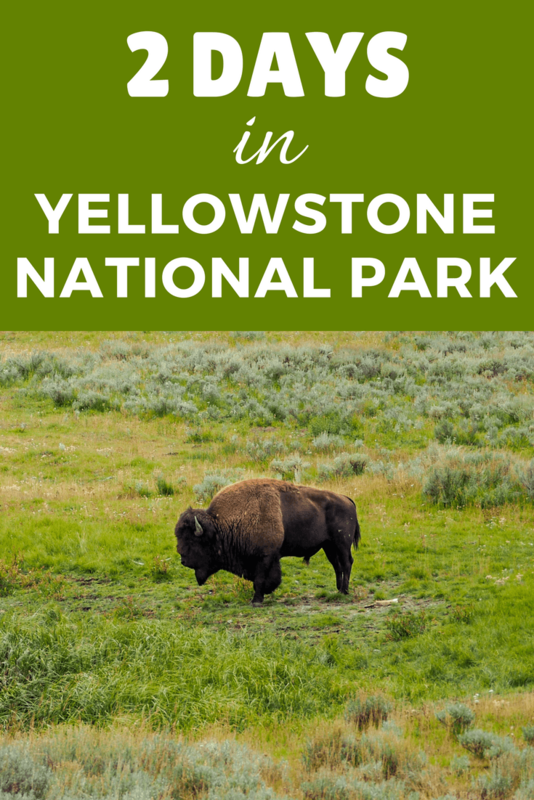 Be sure to allow enough time to visit at least a couple of these in order to really get a feel for Yellowstone and its features (the Canyon and Old Faithful visitor centers were my favorites!). Many people don't have a choice of when they take their vacations (summer is always popular since the kids are out of school! ), but if you do have some flexibility, I would definitely recommend visiting Yellowstone in either the spring or autumn (or even winter!). The park gets really crowded during the summer months, which can take away from the overall experience in my opinion. Have you ever been to Yellowstone? What was your favorite part? What an incredibly gorgeous park! I love its colours. I had heard of Yellowstone Park, but I never knew where it was or what you could find there. Now I know, and I would definitely like to visit it! It’s certainly famous for good reason! 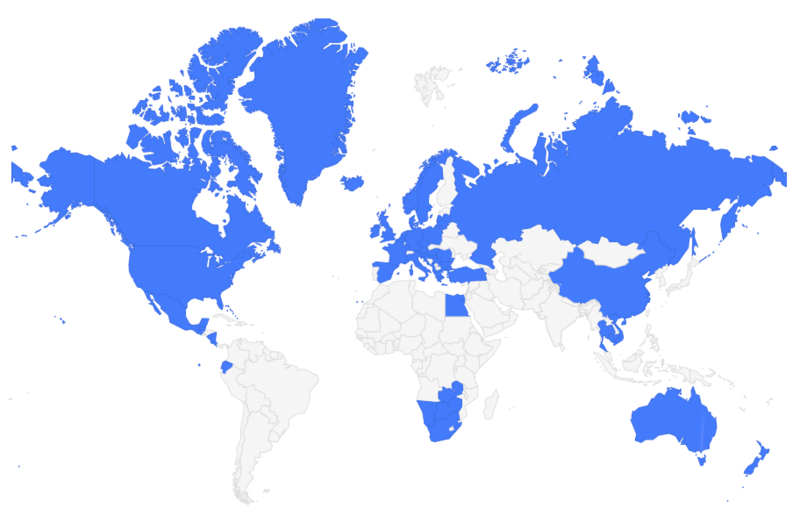 My tip would be to maybe visit during a different season if possible, though – it gets so busy in the summer! I have been to Yellowstone Park just once and I think I will never forget the views! Thank you for sharing these gorgeous photos, seeing them make me want to book a flight to the US right away! It certainly is a beautiful place! Glad I could bring back some good memories for you. Visiting Yellowstone is on my bucket list of life. I have ALWAYS wanted to go there. Fantastic pictures you captured. Thanks for sharing it. I would love to see those bison herds up close and personal. But of course, not too close. I have seen enough nature shows to understand that you have to give all bison – male and female – ample room to navigate, to breath and heck, just to realize that these guys do not respond well to being crowded. As for the entire park it is a study in immense natural beauty. The first national park on earth and one of the prettiest. I have not been there yet but your images are pulling me in. Thanks for sharing with us Akatuki. The bison are really cool but yes, they’re still wild animals and need their space! If I go again, I would love to see some of the wolves! Of course, I’ve heard of Yellowstone, butnit hasn’t really been on my must-do list. After reading this post, I’m ready to take off *right now* and visit. It’s gorgeous! Also, I remember you said you’re getting married early this month (October). Congratulations! Thanks, Natalie! And yes, it’s a really pretty park – definitely worth visiting! Great post! I love seeing geothermal activity up close – I find it fascinating. I loved seeing the dramatic, almost post-apocyliptic action on the North Island in New Zealand – I´ll have to make it over to Yellowstone to check out the geysers and their incredible coloured waters. New Zealand is great for geothermal activity, but Yellowstone’s geyser valley is incredible because there are SO MANY of them there. I’ve not yet been to Yellowstone National Park, or indeed that part of the US! However, I have been to 4 National Parks and Death Valley. And it’s so true about everyone getting out of their car to see wildlife. We did that too, and we were just about to take a closer look at the deer on the other side of the road, and when I tried to open the passenger side, I discovered that there was a wolf outside our car door! I had never been so frightened in my life! Mind you, it was winter. It was snowing. And we were one of the very few tourists in the Yosemite National Park at that time of year – January / February! I have been to Yellowstone Park just once Thank you for sharing these ravishing photographs, seeing them influence me to need to book a flight to the US immediately! That looks really cool.. Grand Teton looks also amazing with all those peaks in the back! There must be some great hikes around the area I guess.. I’d love to hike those mountains one day! Yes, Grand Teton is also really amazing! This is definitely one of the most picturesque national parks and your pictures just prove that, Akatuki! How many days would be enough to explore all of it? To really see all of Yellowstone, I think you’d need at least 4-5 days. We saw the highlights in 2, but we were a bit rushed! Catching up on your posts, and loved this, as well as the Montana story. I am hopeful to take my grandchildren on a road trip to visit Yellowstone soon, and on up to Glacier as well. I know we can’t go wrong with the National Parks, but I also think they would love visiting the Orphan Girl Mine. 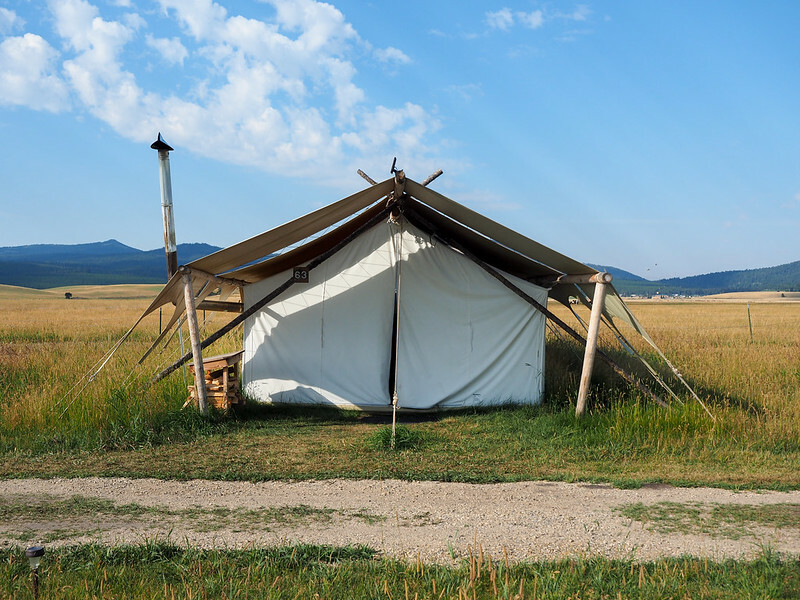 Of course, based on recent trips, their highlight would likely be the Yellowstone Under Canvas experience! They find cabins and tents mighty impressive. Thank you for all the info in both posts! I’m glad you found these posts useful, Roxanna! I think a Montana trip would be great for you and your grandchildren! We’re thinking about going to Yellowstone around Christmas. Do you think it will be super busy then? Any other recommendations for a winter visit? Great post. This makes me want to go even more.